A literary curiosity. 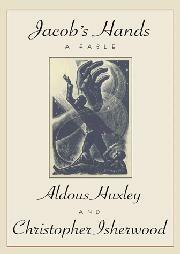 While resident in Hollywood in the 1940s, the acerbic British novelist Aldous Huxley and the playwright Christopher Isherwood collaborated on two screenplays. Though the actual screenplay of “Jacob’s Hands,” the tale of a naive faith healer in the 1920s, apparently no longer exists, a narrative treatment of it was recently located among Huxley’s remaining papers and is now being published. While elements of the tale are clearly reminiscent of these writers (Huxley’s bemused fascination with America’s pursuit of fame and fortune; Isherwood’s deep interest in spirituality), the prose is at best workmanlike. That isn’t surprising—this draft was likely meant for private circulation, not publication. The story focuses on Jacob, a traumatized veteran of WWI who has fled to the Mojave Desert for solitude, but is discovered to carry an uncanny ability to heal in his hands—as well as a gift for sensing the true state of someone’s spirit. Used to practicing his gift on animals, he reluctantly agrees to try to help Sharon, a young crippled woman. He succeeds, becomes infatuated with her, and follows her to Los Angeles, where she has gone determined to become a star. Not surprisingly, Jacob is discovered by a huckster who uses the healer’s love for Sharon (who has become a cynical, opportunistic entertainer) to turn him into a saleable commodity. Romantic complications and betrayals follow, and Jacob eventually flees back to the desert. It’s hard not to imagine the film while reading this spare narrative, but equally hard to find much pleasure in the prose. A minor, if intriguing, footnote to two impressive careers.